Kindergarten reading passages have to be fun to keep kids engaged. Have them read the passage, answer the two multiple choice questions and make all kinds of monkey noises! If you have some trees you can have them swing from the trees, too. Ha ha! Getting out a little energy never hurt anyone! Use the black and white or color copy of this worksheet, or both. 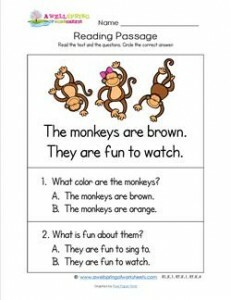 Please go to this page to see all the Kindergarten Reading Passages worksheets in this set.